That’s the new accounts created for KDE’s SVN and git repositories since January 2008. As you can see our feeling was right. Last month 39 new accounts were created. That’s more than 1 account per day! That means more than 1 new developer per day. Pretty amazing if you ask me. Hats off to KDE for being able to attract so many talented new people and for being able to integrate them in the community. PS: Policies on when an account request is granted have not changed in that time. Nice, thanks for blogging :-). Now you might say “but stuff in these repositories gets merged into the main repositories later, at which point those commits should show up on kde-commits anyway”. That’s true in theory, except that: (a) pushes of more than 100 commits don’t have mails sent for their commits as a flood mitigation strategy right now, (b) KDE’s git usage is still so young that many of those first merges haven’t happened yet, (c) some people squash commit history before merging. 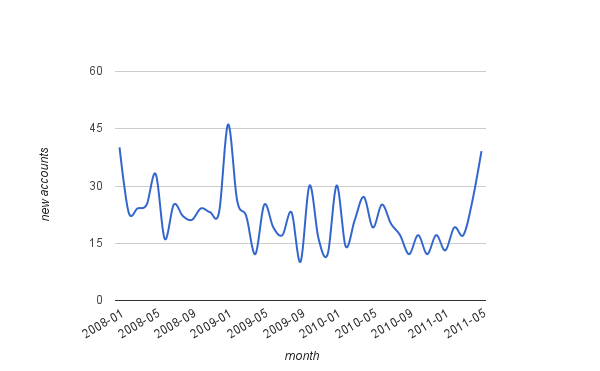 For all those reasons the number of mails resulting from the migration of commits from clone/scratch repositories to main repositories is skewed lower than it would be if all commits got mailed to kde-commits, as was the case with work branches in SVN. Additionally, do keep in mind that kde-commits also receives mails for localization commits. While translation efforts and other localization activities are a vital part of KDE’s development efforts, many people probably don’t realize they’re included there and are probably thinking of development activity in terms of code commits, which would require filtering out localization commits first. Oh, as an addendum to the above: Under the new git rules, the right way to start a new project right now is to do it in a scratch repo, and later request it be moved to the playground area. A repo move like that also doesn’t result in emails for any commits made up to that point. In SVN on the other hand, new projects were started in playground directly, and had commit mails sent for them from the start. There have been plenty of new projects on git following this pattern in the last couple of months, so this is another reason for a decrease in commit mails due to the git migration. Ah, that sounds like it’s it! It did seems very odd to me that a project with KDE’s great fundamentals would appear – very very suddenly, and right near the end of the “main” git migration – to slow down so much. Cheers! Actually I personally wouldn’t be surprised to see some slowdown :). A big motivation for open source work is people scratching their own itches after all, and the KDE 4 series has now come to a point where it’s mature and capable enough that a lot of the itches people had are now gone. To put things a bit more bluntly, the chasing of 3->4 regressions is mostly over (along with the many low-hanging fruit of Qt 3->4 porting), so development activity now focusses on the more challenging task of going into new directions, which motivates less people since the tasks are less obvious. OTOH, that’s precisely why the current upward trend in successful dev account requests (which is partly due to GSoC and Season of KDE, but there are also a lot of new accounts that aren’t related to either) is so exciting, as well as the fact that commit counts actually _don’t_ seem to have decreased all that much or even at all, given the above considerations. – scratch/mattea/kcmgrub2 moved to playground/sysadmin. – scratch/lpapp/libqgit2 moved to playground/libs. – scratch/mommertz/svgmod moved to playground/devtools. – Various Nepomuk-related projects moved from scratch/trueg to playground. – Sune Vuorela’s “prison” barcode data handling library may or may not have been in a scratch repo first (not sure atm about the path it took, and couldn’t reach him for comment), but in any cases dropped a new repo with a couple dozen commits into kdesupport, and has become a new optional dependency for several modules of the upcoming KDE SC 4.7. – QtZeitgeist, a new optional dependency of Phonon, was actually still being developed on Gitorious (as a couple of projects chose to do before we got git.kde.org up and running) and moved over to git.kde.org only recently. Those are only a few; there’s more. So as mentioned there’s a lot kde-commits mails and numbers won’t tell you about :). The point being that a reduction in commit mails may also be related to turnover and lack of new blood among the ranks of our translators, rather than programmers. So you might want to consider helping out with translating :). When we moved the Nepomuk DataManagement service from trueg’s scratch pad, it had around 89 commits.